Check out digital prints, paintings, sculptures, and animations from Paul Beck and Jason Archer, whose art is described as “politically charged and humorous.” If you’ve seen A Scanner Darkly and Waking Life, you already know how good their animation work is. Eat food. Give thanks. Sleep. Football. Sleep. Oh boy. The Fightin’ Texas Aggie Band and the Corps of Cadets do whatever it is they do all over Congress Avenue. Show up early in your finest burnt orange attire and claim a prime heckling spot. Err… we mean, to claim a spot from which you can admire musical talent and drills done by the nation’s largest military-style marching band. Don’t forget to watch the big (volleyball?) game at 11am. Starting at 200 E. Riverside Drive and going all the way up to the Texas State Capitol. 8am-9:30am. Free. Today is November 25, and that means there’s only one month until Christmas. Better start freaking out about all those gifts you have to buy. Why not avoid the mall and combine holiday shopping with an afternoon at an art museum? AMoA-Laguna Gloria’s annual Holiday Art Festival features all kinds of arty goodness that just might put an end to your perfect-gift-search woes. Plus, it’s all pretty ‘n’ stuff there. 11am. Tour at 1pm. $7 general public, $3 museum members, free for kids under 12. 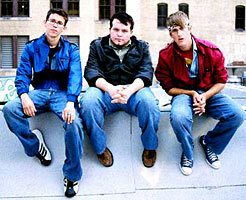 You Me & Greg is Douglas Pena, Phil Aulie, and Greg Spencer. We’re not sure which one is You or which one is Me, but it doesn’t really matter – these dudes are funny. Besides, any show at ColdTowne Theater is bound to be worth your while. 7pm. $7, or $5 with proof of failure. BYOB. Admit it: You’ve forgotten everything you learned in elementary school. Do yourself a favor and re-learn all that stuff – Schoolhouse Rock style. Oh yes! So you’ve been dying to read your haikus to a room full of people. Or you’d like to jam out on your Casio in front of a room full of people. Perhaps you’d just like to be in this hypothetical room full of people. Well, head over to Ruta Maya for all this – plus good coffee, drinks, and food. 6pm. No cover. Happy hour specials all night.